Persecutions by Quraish worsened with more and more conversions to Islam, in Makka. Many poor converts like Bilal (R.A) and Ammar suffered inhumane torture and even the prestigious converts were not spared at all. In 615 A.D. Prophet (PBUH) allowed the Muslims to migrate to Abyssinia because the ruler Najashi was a far and polite one. The group consisted of 15 emigrants. Quraish notables were sent with huge bribes and gifts, after the Muslims to ask Najashi to return them. Fortunately, Najashi turned down the appeal of Quraish after he heard the verses of Surah Maryam from Jaffar (R.A) and allowed the Muslims to live in Abyssinia as long as they want to. After this successful migration, Muslims began to believe that a migration to Medina would be much more beneficial and that they would be totally free from the oppression of Quraish. In 616 A.D. the Quraish imposed a three-year long socio-economic boycott on the Banu Hashim true in order to isolate Prophet (PBUH) and his followers from active Makkan life and preaching activities. These years proved to no less than a survival challenge for them as they had to live under the scorching sun with scarce food items and water. Many people died due to starvation and hunger. The boycott was ended in 619 A.D. Holy Prophet (PBUH) suffered a dual loss as his beloved wife, Khadija (R.A) and his caring uncle, Abu Talib succumbed to death. This marked the end of Jiwar (tribal protection) for Prophet (PBUH) and the moral support which was very necessary for him to continue his campaign of flourishing Islam. Consequently, he visited the valley of Taif to convey the message of faith. It was populated by Bani Thaqeef which was the second strongest tribe of Arabia and they proved to be more obstinate. They set street hooligans after Prophet (PBUH) who showered abuses and hurled stones at him. So, he had to escape Taif and his attempt of preaching Islam there failed. Prophet (PBUH) then shifted his attention towards the pilgrims from Medina. He addressed them successfully between 620 to 622 A.D. in 620 A.D, a group of six Medinite of Khazraj tribe, who came to Makka for pilgrimage, accepted Islam and promised to preach whatever they had learned from Prophet (PBUH). This was a great encouragement for Prophet (PBUH). Next year, 621 A.D, another group of pilgrims consisting of 11 persons, two from Aws tribe, not only accepted Islam but also pledged to protect Prophet (PBUH) in peace time. This is known as the first Pledge of Aqaba. In 622 A.D, even a larger delegation met him at Aqaba and accepted Islan. They were 75 in total with 73 men and 2 women who offered refuge to Prophet (PBUH) in Medina and pledged that they will provide protection to Prophet (PBUH) in a case of an armed conflict against the Makkans. This is called the second Pledge of Aqaba. As a result of these pledges, several Muslims began to leave for Medina. Later Prophet (PBUH) also migrated to Medina after he was divinely informed about the Makkan’s plan of slaying Prophet (PBUH) inside his residency. After the pledges of Aqabah family after the family left for Medina. When the Quraish came to know about this, they increased their persecutions on Prophet( PBUH) and his followers. Meanwhile, all the companions of Holy Prophet(PBUH) except Hazrat Abu Bakr(R.A) and Hazrat Ali(R.A) succeeded in migration to Medina. When the Makkans saw the cave, they turned around because the entrance was covered with a cobweb and there was a pair of pigeons on the threshold. This happened miraculously and it convinced the Makkans that the cave was empty when they saw the branches of a tree that covered the mouth of the cave nearby. After this incident, they departed from the cave and continued their journey. Meanwhile, Holy Prophet (PBUH) and Hazrat Abu Bakr (R.A) saw two isolated tents. There lived an old woman who had a goat which could not give milk. Prophet (PBUH) touched its udder and it began to provide milk. The party then refreshed by drinking milk and set to their journey to Medina. Afterward, Prophet (PBUH) met Buraidah bin al-Husaib and about 80 other men. All of them accepted Islam and performed Salah with Prophet (PBUH) and Abu Bakr (R.A). A large platform with a thatched roof was built in one of the corners of the Masjid-e-Nabvi. This was known as Suffah which provided shelter for poor Madinites. Another important event that took place was the Charter of Medina. Holy Prophet (PBUH) realized that the foundation of Islamic Empire would be weak unless it got the support of all people of Medina. So, in order to gain support, immediately after settlement, Holy Prophet (PBUH) called Muslims and Jewish tribes together for consultation. In the end, an agreement was reached which granted equal rights to Jews with the freedom to practice their religion openly. It stated that Muslims and Jews were allies and would assist each other in case of an attack on Medina. Also that there would be no disputes between the two groups or otherwise the peace agreement would be terminated. 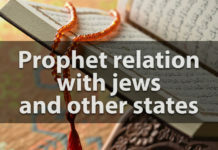 As a result of this Charter, the relations between Muslims and Jews were regulated and gradually, Holy Prophet (PBUH) established himself as the leader and the head of the state of Medina. ” THOSE WHO BELIEVE, EMIGRATE, STRUGGLE IN ALLAH’S WAY AND THOSE WHO GIVE SHELTER AND HELP, THEY INDEED ARE THE TRUE BELIEVERS. FOR THEM WILL BE FORGIVENESS AND HONORABLE PROVISION”. After the establishment of this brotherhood now came the treaty with Jews known as the Charter of Medina. There were three main tribes: Banu Qunaiqa, Banu Nazir, and Banu Quraiza settled in the suburbs of Medina in their own strong fortresses. Holy Prophet (PBUH) realized that the foundation would be very weak unless it got the support of all people living in Medina. The situation called for a strong measure of coordination and adjustment, particularly as Muslims were threatened by Quraish. Therefore as soon as Holy Prophet (PBUH) was settled in Medina, he called together the Muslims and Jewish tribes for consultation. He invited them to consider the possibility of establishing some system of co-operation whereby the safety of Medina might be secured. After an exchange of views, an agreement was reached which granted equal rights to Jews with full liberty to follow their own faith without any interference by Muslims. It stated that the Muslims and Jews were allies and would help each other, that neither party would commit aggression against the others, and in the case of an attack on Medina, both Muslims and Jews will defend it. Furthermore, it guaranteed the protection of their life and property. By virtue of this agreement, the relations between the Muslims and Jews were regulated. It also established Holy Prophet (PBUH) as a leader and the head of state. Next day, the battle was begun. It was fought in three stages: war of words, one on one combat and general fighting. in Ramazan 3 A.H, the Quraish wanted to avenge their loss at Badr. For this, they raised an army of 3000 well-equipped men of whom 700 had coats of mail, with 200 horses and 3000 camels which were led by Abu Sufyan. Prophet (PBUH) held a meeting and an army of 1000 Muslims, including 300 horsemen of Abdullah bin Ubbay. After marching a few miles he deserted his 300 men from the army; leaving only 700 Muslims behind. Next day, early in the morning, Prophet (PBUH) occupied the western slope of the Uhad Hill, so Muslims stood a safer position. On the hill, there was a little pass which enemies could use to attack from the rear, so Prophet (PBUH) appointed 50 archers. They were strictly instructed not to leave their positions unless they were commanded to. 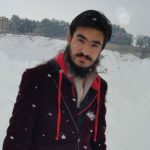 After the war of words and the war of individuals, Talha and his brother Usman were killed by Ali (R.A) and Usman (R.A). The general fighting initiated and soon Makkans began to retreat and at that moment, 38 archers left their positions and got busy in the collection of war booty. When Khalid bin Walid (R.A) saw this, he attacked from the rear passage along with his men, but Prophet (PBUH) was surrounded by many faithful followers so they turned back. In the meantime, a rumor was spread that Prophet (PBUH) had been martyred which morally disintegrated the Muslims. It also allowed the Makkans to relax. As soon as this news was marked as false, the enemies decided to return to Makka as they already got the revenge by killing 70 Muslims against a loss of only 10 men. During Prophet’s (PBUH) life in Medina, Treaty of Hudaibiyah was signed. When Prophet (PBUH) entered Medina, there were three tribes of Jews: Banu Nazir, Banu Quraiyaza, and Banu Qainuqa, which had settled in their strong fortresses. Holy Prophet (PBUH) realized that the foundation of Islamic Empire would be very weak unless it got the support from all of the people living in Medina. The situation called for a strong measure of coordination and adjustment as Quraish seriously threatened Muslims. Prophet (PBUH) invited Jewish tribes to consider the possibility of establishing some system of mutual coordination and safety. After the exchange of views, an agreement was reached which granted equal rights to Jews with the freedom to practice their faith. It stated that Muslims and Jews were allies and would help each other, that neither of the party would commit aggression against one and other and in the case of an attack on Medina, both Muslims and Jews would defend it. This also guaranteed the protection of Muslims’ life and property. By virtue of this agreement, the relations between the Muslims and Jews were regulated on the basis for which some part of the governance of Medina was granted to Muslims. “VERILY WE HAVE INDEED GRANTED THEE A MANIFEST VICTORY”. 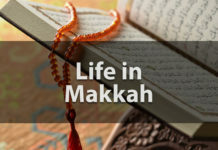 In the 10th year of A.H, Holy Prophet (PBUH) decided to visit Makka to perform a pilgrimage. He along with 1400 of his followers and accompanied by all his wives reached Makka. On 9th Zilhaj, at the plain of Arafat, near the Mount of Mercy, he delivered his last sermon. This sermon contains imperishable knowledge for the mankind and can be termed as the first universal charter of human rights. He prohibited all corrupted ideas of pagans and laid emphasis on the sanctity of life. He told the people to fulfill the rights of fellow beings and praise Allah alone, Who is One and has no partners. He also told that the slaves must be treated according to their rights and not like some minor creatures. 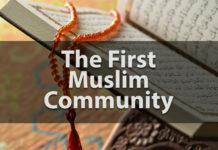 He informed the believers that he is the last messenger of Allah and there would be none after him and also that Islam is the universal religion, compiling all the faiths that had been previously preached by the earlier messengers and prophets. Can u plz also write about Battle of trench,hunain,mutah,tabuk expedition, conquest of Makkah?